How to Trash a $10,000 Kid’s Room in 10 Seconds! The other day a Restoration Hardware catalog showed up at our house. Before my mom threw in away I checked it out. All I can say is WTF? In what world would a kid’s room look like this? If the bedroom like the one pictured at left was in my possession, that “Vintage White” nightstand would be “BP Oil Sludge Black” quicker than you could say, “Leave me alone I’m dyeing my doll’s hair with black watercolor.” And once I dragged that step stool up on the bed and pulled off the chandelier pieces I’d have a swell necklace for my dolls and I — AND a concussion! Personally, I have a very functional bedroom set for my baby daughter Madison made of 100% reclaimed items. A cardboard trunk from my Disney Princess Dress Up Trunk is the crib and the bedding is one of my dad’s handkerchief (I assume that’s what it is. It’s what my mom handed me after she took all of the dishcloths back.) 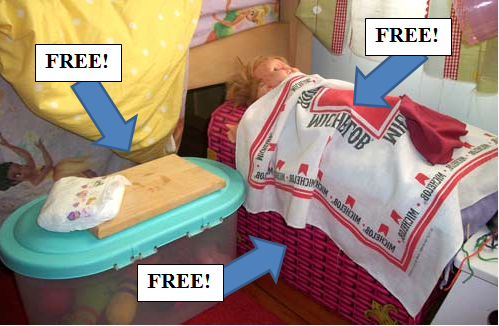 The changing table is fashioned out of a plastic box and a piece of sample wood from when my parents foolishly thought they could afford a deck — preschool ain’t cheap people! 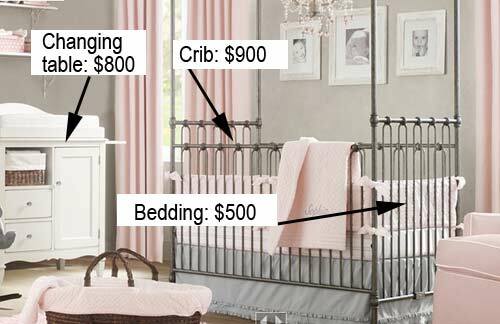 Tags: bedding, crib, kids furniture, nursery, restoration hardware | Permalink. Lily, they should hire you to test drive furniture collections first… or at least present the collection to you first, so you can outline your nefarious plans. Thank you pointing out the “Michelob” blanket. That is hysterical. I didn’t even notice. Michelob was the first thing I noticed. No swanky Heinkeen merchandising eh? Marlboro? Oh Lily how I’ve missed you! Rock on girlfriend!